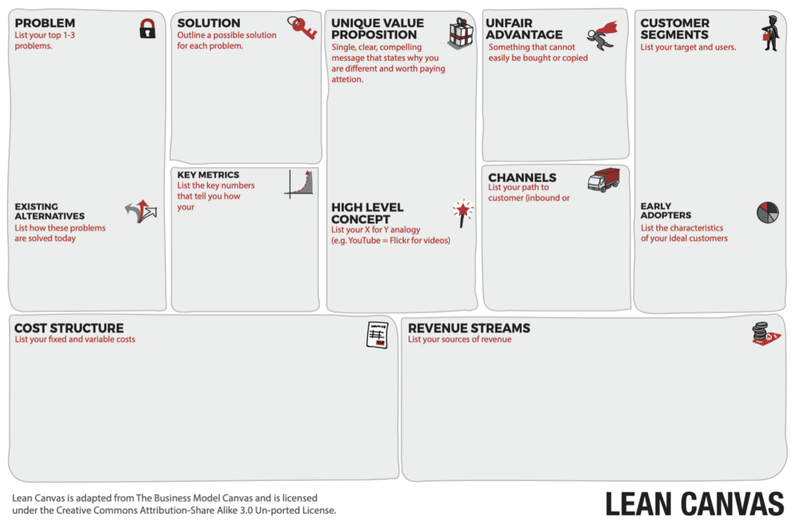 A question I get a lot is: Why isn’t the Lean Canvas laid out more logically? Anyone that has attempted to fill one can relate. You have to jump around from box to box in a seemingly random order. The main reason for this particular layout was legacy. 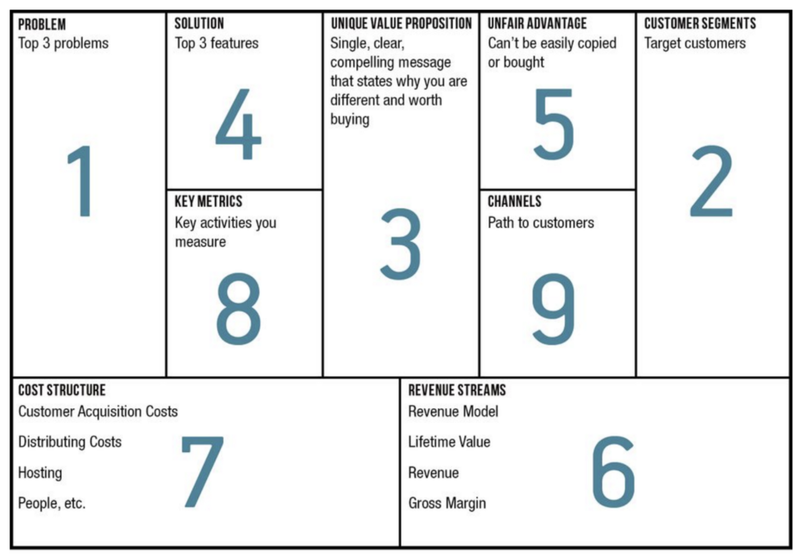 Lean Canvas was derived from the Business Model Canvas. And instead of changing the canvas layout, I chose to adopt a self-imposed design constraint: Every time I added a new box (like Problem), I’d remove an old box (like Key Partners). To compensate for usability, I published a suggested fill order in my first book: Running Lean. Over the years, however, I found myself tweaking this fill order for better flow. While starting with customers and problems was always the common thread, the ordering of the other boxes changed ever so slightly. The original question then morphed into: Why is there a different suggested fill order across your books and the online app? Which is the right order? After years of coaching and reviewing of thousands of Lean Canvases, I have finally uncovered the right fill order and I’m ready to reveal it. As you can see from this list, ideas (yes, even good ones) can come from anywhere. The best way to find a good idea is to have lots of them. Idea generation doesn’t have to start with customers and problems. 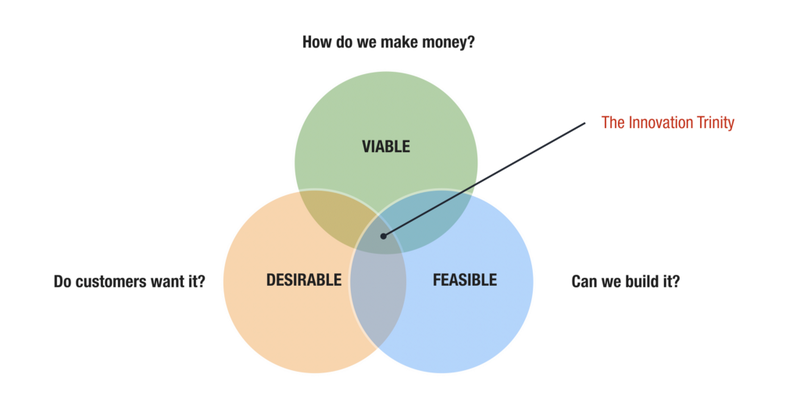 The real challenge, however, isn’t with idea generation, but idea validation. An effective validation plan prioritizes the testing of your riskiest assumptions first. How do you uncover your riskiest assumptions? This is where a Lean Canvas, properly used, can help. As with jigsaw puzzles, ideas can have many different starting points. Irrespective of where you start though, you still need to end up with a picture that comes together (business model story). The goal of sketching a Lean Canvas is deconstructing an idea so that you see it more clearly. While imposing a starting point (like customer and problems) was well-intentioned (because they tend to the riskier boxes), I found that too many people would often fake these boxes anyway. They would write problem statements to justify a solution that they already wanted to build. And, in the process, gave themselves a false sense of comfort. When you’ve already decided to build a hammer, everything looks like a nail. Yes, this is the Innovator’s Bias. The most amazing part is that people don’t even realize they are doing this. So now I take a different approach. Before you can confront your Innovator’s Bias, you have to be able to see it. Instead of imposing a specific order, I now direct people to fill out their canvas by starting with their idea backstory. These triggers reveal a lot about the situation, context, biases, and pitfalls that often also come along for the ride. The goal of a first Lean canvas isn’t achieving perfection, but taking a snapshot. I recommend setting a timer for 20 minutes and filling out as many boxes as you can within that time limit. It’s okay to leave boxes blank. Start with your idea backstory. Even though your idea may have felt like a flash of inspiration, ideas can always be traced back to one or more specific events or triggers that caused you to take action. The Uber founders, for instance, supposedly got the idea after they were unable to find a taxi after an event in Paris. They encountered a problem and decided to do something about it (scratch your own itch). If I were sketching that canvas, I’d start with the problem box. If you want to give it a go, you can get started with a blank Lean Canvas template at http://leancanvas.com. What were the first three boxes you filled? Where you start is quite telling. Filling out a Lean Canvas is essentially stacking a chain of beliefs that build on each other. The early links in the chain constrain and shape your idea. Also, any faulty or weak assumptions early in the chain have a ripple effect. This is why it’s particularly insightful to introspectively study and be critical of the early links in your chain of beliefs — your idea backstory. What’s interesting to note here is that the seemingly random order of the Lean Canvas is actually a gift in disguise. Had the Lean Canvas been organized more logically, people might be led to fill it in that order and miss following their own more natural thinking order. Not surprisingly, the solution box often makes the top starting point for most ideas. Next in line are probably revenue/growth directives and exploiting a preexisting unfair advantage. - a fact (based on empirical data). This will help you take stock of just how grounded your idea is currently. The point of this exercise isn’t to fault your idea generation method. Remember that “good ideas” can come from anywhere. But how you act on your idea is a much greater determinant of success, than the source of the idea itself. Make sure the starting links in your chain cover all three risks and that they are ideally grounded in factual data. If not, you know what to do next. Get some answers by running some learning experiments. 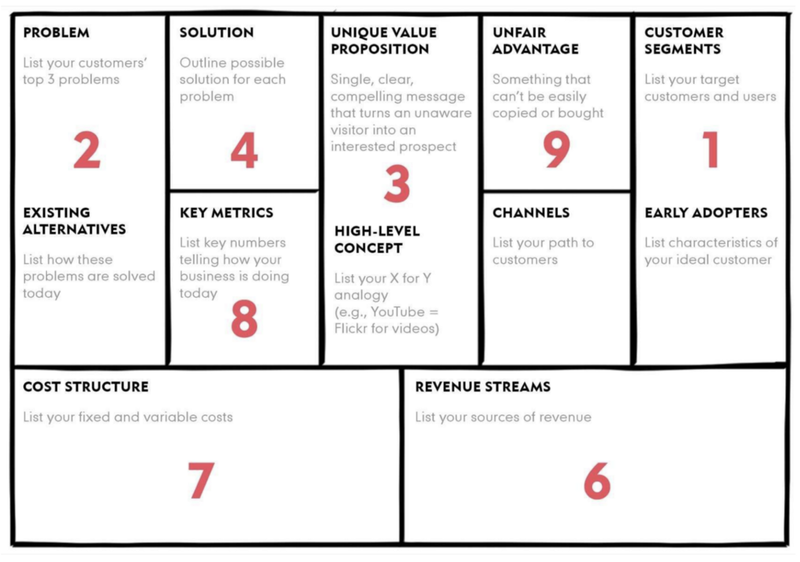 What is the Right Fill Order for a Lean Canvas? was originally published in Love the Problem on Medium, where people are continuing the conversation by highlighting and responding to this story.